The 2016 Summer Olympics are finally upon us, and although it’s an exciting feeling to watch your favorite athletes compete, you can’t help but feel a little out of shape while sitting on the couch. Chasing your own fitness goals can be challenging, but we've selected some athletic shoes that will get you closer to the gold! You need a sport-specific shoe if you are involved with particular sports or activities multiple times a week. Court sports, like basketball and tennis, require your feet to move in all sorts of directions. The key to finding a sturdy court shoe is finding a stable sole that offers support for when you run and jump. Field sports, such as soccer and football, usually have cleats, studs or spikes to accommodate the type of ground or field you’re playing on. It is important to remember that proper-fitting sports shoes can improve your performance and also help prevent injuries. Check out the trendy and reliable options below and pick up your feet! Be the next Alex Morgan with the Adidas Ace 16.4 Fxg. With a lightweight feel and a synthetic upper lining that comfortably forms to your foot, this shoe will assist you with the agility and ball control you need to bring out the best in your game. This shoe has a flexible outsole that works to provide maximum stability on rough, hard surfaces. This modern look will have you scoring major style points! The Nike Air Vapor Ace will keep your style fresh and your feet cool on the court. This tennis shoe provides lightweight cushioning and a breathable, yet supportive upper for comfortable play and practice. The rubber grooved outsole provides traction and flexibility. Show your competition how it's done! Be untouchable with the Asics Hyper Rocketgirl 6 Racing Flats. Made for sprinting, this shoe is lightweight and focuses on durability and traction with the Pebax spike plate. The SpEVA midsole material improves bounce-back characteristics and decreases midsole breakdown. The only thing on your mind will be the finish line! The Asics Snapdown is an exceptional mid-level wrestling shoe. Serradial traction pods at the forefoot and rear provide you with flexibility and enough grip to avoid slipping on the mat. The integrated lace garage safely tucks away laces so you can pin for the win! Get up and down the field quicker with the Adidas Predito Instinct FG. Made with Predator technology for power, swerve and ball contact, this updated version will let your relentless skills be shown. This cleat has a flexible ground outsole that ensures maximum grip on outdoor surfaces. A breakthrough year is yours with the Adidas Predito Instinct FG. We saved our newest pick for last...designed for the game's most unguardable player: Stephen Curry! What better way to show some USA pride than with the red, white and navy Under Armour Sc30 Top Game basketball shoes. This shoe is designed with a molded synthetic upper that wraps around our ankle giving you a lightweight and precise fit, and a full length midsole that absorbs impact for those hard landings. Be a star on the court with the Under Armour Sc30 Top Game’s excellent support, cushioning and comfort. You might not make it to the podium in Rio, but you will make a difference for yourself or a team when you have the right footwear. 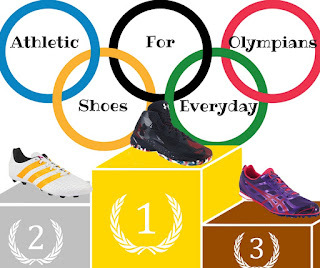 Check out our website for more styles and colors to find the perfect athletic shoe for you. GO USA!